Acwa Power, a leading developer, owner, and operator of power generation and water desalination plants based in Saudi Arabia, said it has joined hands with three international groups - Spanish company Abengoa and Chinese firms Industrial and Commercial Bank of China Limited (ICBC), Shanghai Electric Group Company (SEGC) - to set up the world's largest renewable energy project in Dubai, UAE. As per the deal, Acwa Power is lead developer on the project, while ICBC has established its role as an international lender for Noor Energy 1. Earlier this year the Saudi-based firm had signed an engineering, procurement and construction (EPC) agreement with SEGC, while Abengoa was roped in as one of the main technology providers and key subcontractors for the plant. 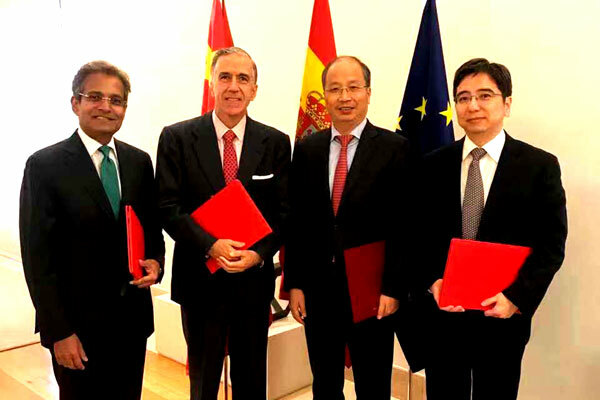 The deal for the 950 MW Noor Energy 1 Plant in Dubai was signed by Paddy Padmanathan, the president and chief executive of ACWA Power; Yi Huiman, the chairman of ICBC; Huang Ou, the chief executive of SEGC and Gonzalo Urquijo, the executive chairman of Abengoa at the Official Residence of the President of Government of Spain in the presence of Chinese President Xi Jinping, during his official visit to Spain, and the Spanish Prime Minister Pedro Sánchez. On the new partnership, Padmanathan said: "The coming together of the four enterprises who are leaders in our own respective fields: Acwa Power - a leader in development and operation of power plants, Abengoa - concentrated solar power technology provider, Shanghai Electric, EPC Contractor and ICBC Project finance MLA; from three countries, Spain, China and Saudi Arabia to deliver this iconic energy plant." "On completion, it will deliver electricity day and night generated entirely by solar energy at a competitive cost in yet another country such as the UAE is the proof of the immense value that can be created by collaboration than isolation very much reflecting the spirit of the belt and road strategy that is being implemented by China under President Xi’s leadership," stated the top official. Padmanathan said Acwa was proud to be the catalysts for this collaboration on a global scale in this instance focused at accelerating the decarbonisation of power generation by enabling the reliable delivery of solar power day and night and looked forward to working with these entities within the framework of the agreement to identify and execute meaningful market opportunities that would allow the group to continue to reliably deliver electricity and desalinated water at the lowest cost. The Dewa IV IPP project, which was awarded to a consortium led by Acwa Power last year, is the fourth phase of the Mohammed bin Rashid Solar Park, the largest single-site concentrated solar power plant in the world. The project, initially expected to deliver 700 MW of energy, will use a state-of-the-art combination of the world’s tallest 260-m-high solar tower that will generate 100MW, three stations of parabolic trough concentrated solar power (CSP) each producing 200MW, and 250MW generated from photovoltaic panels to yield a total capacity output of 950MW. The project is expected to deliver electricity at a levelised tariff of $7.323 cents per kilowatt-hour 24 hours a day; a cost level that competes with fossil fuel generated electricity without subsidy for reliable and dispatchable solar energy round-the-clock, said Acwa Power in its statement.